Magician by Raymond E.Feist may be the best fantasy book ever written, but WOT is the best fantasy series in the world. I know many thought it just keep on going and going, but that only means more for me to love. When I in 2007 learned that Robert Jordan had passed away I was devastated. Not only cos of selfish reasons (cos that had been my biggest fear even before I heard he was ill), but also because he was a master with what he was doing. And I know he loved his books and his fans. But then I heard that his legacy would go on, because Jordan had until the end kept on working. The chosen person was Brandon Sanderson, who was a big fan of his works (and an accomplished writer). Jordan had left notes, materials, outline, and written sections, and Sanderson filled in the holes. The finished project was huge and later it was realized the book had to be made into 3. First let me say that I felt like I was reading Robert Jordan own writing, only here and there I noticed Sanderson's voice. Mostly when it came to explanations. Things we knew, but perhaps he wanted to make sure to all that he also knew, then again it had been a while so it was all good. I did not mind. The script is still Jordan's, it just needed a new producer to put it all together. I had been very afraid that I would see too much of Sanderson, but he melted together just fine and put in his own voice. I approved. Ok spoilers. Not other way to do this! Rand is still going crazy, oh how I love him! Not to mention Lews Therin. It is getting darker and people around him is staring to loose faith. Egwene is still a prisoner and trying to undermine Elaida's control. I never really liked Egwene really but for some reason I like her now. Elayne was no where to be soon, no Lan either, and no Logain. I really hoped he didn't die and I forgot. Aviendha came by briefly (here I did notice the new writer). Some Mat and Perrin, but not much. Getting a bit annoyed by Mat, I am afraid he will stand with those stupid Seanchan. Oh I despise them, they can't believe in the Forsaken, they treat people who can channel like crap, and if they win in the end I will go insane. Moraine is really still alive!? Asmodean? I am pretty sure Rand will die :( Oh and Gawyn is an idiot, and don't even get me started on the Children of the Light. Where is Morgause? Get home and talk to Gawyn, please! This world is going to hell even if they win the Last battle. Well at least I still love the Aiel. 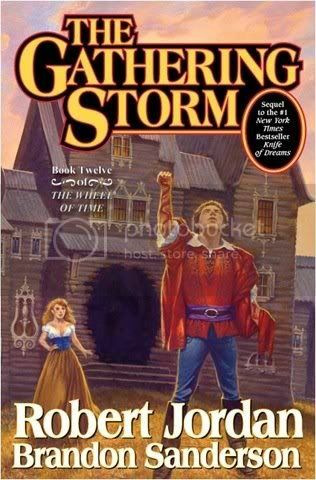 This book picked up the pace, and the whole book is one big "The storm is coming, let's make haste and ride up north". I was really enjoying it, things played out, armies moved, people died. Sure they are not at the last battle yet, The Forsaken is still free, there is still wars going on, and the Shadow is causing big ripples in the thread. But they are close, so if the last book is all about the war. Then the second will finally bring everyone together. It has been some time since that. By the way, Elayne, the babies, shouldn't she be due soon, and oh that will go to hell too. Cos of that idiot everyone thinks is the father. Hopefully Rand will stop by Caemelyn...and perhaps get blinded by Galad or Gawyn? Oh yes I can see that. This was mostly a post of all the characters, cos how else can I talk about a series I have been reading for 13 years? This is great fantasy, I love it to pieces, even if I might never read book 15 two times depending on the outcome. Yes Rand is a fictional crazy boyfriend. I love to re-read this series, and this is to me great fantasy, epic fantasy that is so richly created it takes your breath away. Thank you Brandon Sanderson for doing a great job with this epic legacy. Blodeuedd's Cover Corner: Not liking it at all. If you look closely you can see how rich her make-up is, and to say this nicely, well she looks like a lady of the night, perhaps Rand destroyed a brothel. Reason for Reading. My own copy, have been waiting for 3 years to read it. Final thoughts: LOVE IT. WOT is fantasy at its best. I don't do a lot of fantasy..when I do read it I enjoy it...and this series sounds pretty awesome! Oh wow! I had no idea that Robert Jordan had passed away.I never followed any male authors, and he was one with so many books that I never really looked too closely into the Wheels of Time series. But I think that's going to change. Your post has inspired me to enter into this world that Robert Jordan spent so much of his time in and to have it carried on by another author is just amazing. I have been reading RA Salvatore and Drizzt and I have been loving them so far. So I think my misconception of male authors has been eliminated. I'm so happy to read that you found Sanderson's writing to mesh and flow so well with Robert Jordan's, making the book a very special read for you! I love the new header! Adore the picture. I love fantasy, this was one of the first i ever read and it will always stay with me. Lol, I have mostly read male authors, then i started to read some female ones too, but for some reason I prefer the male ones. I read a salvarore once, then i tried another book but it was like book...way in and I was lost. sadly. I do like to chance. Have you read any of Brandon Sanderson's other books? Elantris is an excellent stand alone novel. EXcellent review, though I did skip the spoilers. I think I left off at book 9 so I still have a ways to go before finishing this series. Glad that the author transition was seamless!! Here's an author that I've always meant to try and have not. I agree with your cover thoughts, not the best of covers. Maybe they'll rethink or re-do them at a later date. I love fantasy, so now that you've reminded me of what I've been missing, I'll have to give the books a try. Wow, 12 books, I could be reading for a while, lol. I didn't know that Jordan had passed, but he will never be forgot because of fans like you. Thanks for a great review!! I read the first book in this seris years ago and never read another one. I will have to start again. I've seen a few reviews of Robert Jordan's lately. Would like to have another go at them. And I love your header. Oh yes, it was huge!!!!! Even to hold it was hard. No, never. I first heard about him, 2 years ago, and first this year I saw his books around. But still not read him. Oh yes not with the Finnish! I get so annoyed when they split fantasy to 2-3 books sometimes. That is sure a way to get money for them (cos yes better to read smaller books, but to buy them, no way. They do seem to stick with those covers. Actually one book I read had a good one, but that was a translation. He is wonderful, gotta love him. I know people think they drag along, I thought so too, but never stopped me from loving the books. I am so glad this worked for you..
Nice when a follow up book does the job you were waiting on..
My weird spoiler, lol, had to get all my thoughts out. Oh yes read them, read them. Do continue.